While the royal world is eyeing Sweden at the moment, there was a rare royal outing going on in the Grand Duchy today. 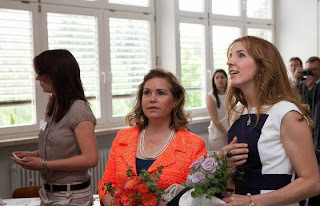 Grand Duchess Maria Teresa accompanied by her daughter-in-law Princess Tessy visited the École Privée Marie-Consolatrice in Esch-sur-Alzette. The school is celebrating its 125th anniversary this year and more festivities will be held during the coming weeks and months. The va va voom-looking Tessy is a former student of the school, at least according to Wort. Her official bio does not mention the school though that doesn't mean anything as they are lacking in many cases. (She can be happy that she finally has one, albeit as a footnote in her husband's one, I suppose...) The princess' family is from Niederkorn, north-west of Esch, where she attended the local primary school. She also went to the Lycée Technique Matthias Adam in Pétange. More pictures of the two ladies at the school in Esch are located at Wort in French, Wort in English and Wort in German.